For nearly 25 years the old Weller Library, once the finest home in Waitsburg, stood vacant just a block from the downtown district on Main Street. As time went by, the house fell into disrepair and came to be referred to as the 'old haunted house'. Finally, in 1971, a group of citizens formed the nonprofit Historical Society, and together with local organizations, businesses, and individuals, began the difficult task of restoring this once beautiful home, originally the home of the Bruce family. Some 50 years after the Lewis and Clark expedition opened the door to the west, settlers began to migrate during the "Emigrant Movement." They traveled the Oregon trail by wagon to Fort Walla Walla, which provided protection from the Indians. Others came back to the area after serving in the Indian Wars in the 1850's. Some came to mine in the Idaho gold fields after pursuing a similar dream in California. Land grants were claimed by building log cabins, farming, and raising families. The settlers lived in rural agricultural settlements throughout the valley, including the one where Waitsburg is now. The first claims near the confluence of the Coppei and the Touchet were made in 1859. At that time, the hills were covered with bunch grass, which was good for raising cattle and they soon realized that the rich soil was ideal for growing wheat and other grains. This led to further settlement as land away from the river bottoms suddenly became more desirable. A small town, called Coppei, struggled for existence a few miles up Coppei Creek, along a branch of the old Nez Perce trail, and it was served by a stagecoach. William 'Perry' Bruce and his wife Caroline were among the early settlers who moved to this area in 1861 when Waitsburg was not yet a town and the area was still largely unsettled. At this time in American history, thousands of people were migrating west in search of better places to live and raise their families. 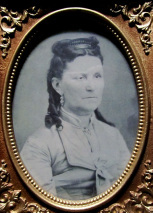 'Perry', as Mr. Bruce was called, and Caroline left their home in Indiana and traveled first to Oregon before heading to Washington Territory in 1861 with their five children. Their oldest child, John, was ten years old. Mary Ellen was six, James was five, Isadora was three, and Edward was just a small baby. Perry's brother already lived here and had built a cabin on Coppei Creek. The Bruce family lived with him that first winter. It was an especially hard winter with deep snow and severe cold. 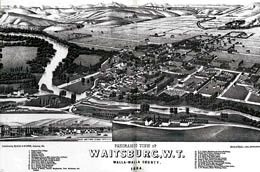 The next year, 1862, they bought a large piece of land, a homestead claim, which is where the city of Waitsburg was later begun. They built a log house close to what is now West Third and Main Street at the north end of the block. When their little boy, Edward, was three years old he wandered down the hill behind their house to play and accidentally drowned in the deep spring located there. His mother was heartbroken and wanted him buried on the far hill that she could see from her front porch. It's said that the 'widow's walk' of Bruce Mansion was built so she could see his resting place. The hill became our city cemetery and he was the first to be buried there. Mr. Bruce became a successful merchant, business man, and farmer. 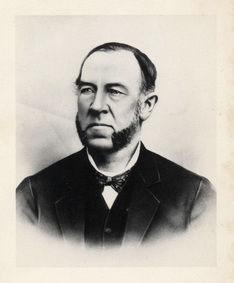 He led the effort to expand the railroad to connect our area with other cities, helped establish the Walla Walla newspaper, and was very active in the community and schools, as well as raising horses. He operated a general store with E. L. Powell, who would later become his son-in-law, marrying his youngest daughter, Isadora. The store still exists, and is now called Waitsburg Hardware and Mercantile. By 1883, the children were already grown and raising their own families when Perry and Caroline built the "showpiece of the town." The two-story home was of Victorian Italianate architecture, a popular style during that time. In strict symmetry, the square plan features a low truncated hip roof with widow's walk detail, and bay windows flank a central entrance portico. Ornate furnishings, crystal kerosene chandeliers, and hand carved millwork including gold leaf cornice trim in the sitting room were the pinnacle of elegance for the time. Eight wood stoves provided warmth throughout the house, an indulgent luxury in the pioneering west. The wooden newel post and handrail of the staircase was hand carved and shipped "around the Horn" of South America from India, Perry's birthplace. Despite the luxurious details, the home was built in an era when there was no indoor plumbing or electricity. The toilet was an outhouse. Baths were taken once a week in the kitchen. The water was brought into the house and heated on the stove. Since there was no electricity, candles were used as well as kerosene lamps that hung down from the ceiling. These chandeliers had many crystal prisms to reflect the light after the wicks were lit. Perry enjoyed living in the grand home for five years before he died at the young age of 63. Caroline Bruce was kept very busy maintaining the household but was also very active in her church. She frequently held ice cream socials in her front yard. The ice cream was hand-churned, made with fresh cream and strawberries or the fruit that was in season. As a grandmother, Caroline loved having her grandchildren visit and always had a supply of white peppermint candy for them. She lived in the beautiful house until 1892. 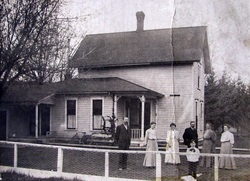 The Bruces' eldest daughter, Mary Ellen, and members of her family lived in the home for the next thirty years after Perry and Caroline passed away. Mary Ellen and her husband, Henry Abbey, had four children. One of her great-great grandsons, Bruce Abbey, still lives in Waitsburg and grows wheat. In the upstairs hall is a Bruce family tree, and several people on the diagram have visited the museum. While hauling supplies to the Idaho gold mining country, an early settler named "Doc" Willard met a miller by the name of Sylvester M. Wait. Wait was interested in building a mill and Willard convinced him to do so on the Touchet River because of a high price for flour in the area compared with the price of wheat. He and William Perry Bruce donated the land, and working with other settlers, they pledged the first year's crop to the new enterprise, which would negate the need to haul wheat to Walla Walla, a day's journey away. The story is told that on Wait's journey to the mill site, he lost a saddlebag containing some $5000, his life's savings. He backtracked past a cossroads and found a wagon heading in the opposite direction. He asked the driver if he had seen the saddlebag and indeed, he had picked it up and was taking it, unopened, to a nearby settlement where the owner would be likely to inquire after it. Thanks to the honest wagon man, Waitsburg did not end before it began. Using credit and borrowed money, Wait built a mill at a total cost of about $14,000. Lumber was scarce, and structures such as old sheep corrals were repurposed. Large timbers were felled in the nearby Blue Mountains and brought to the construction site by horses and mules. While construction was under way, Wait traveled to San Francisco to procure the necessary machinery. The mill opened in time for the harvest of 1865, with a single set of buhrstones. With the advent of the mill, it became obvious that the village of Coppei could not survive and it was dismantled and the lumber used in the new town. A school, stores, hotels, and saloons soon appeared. The stage line was also rerouted. After a year of operation, Wait sold a half interest in his business to William and Platt Preston, who sold flour at the mill site to pack trains headed for the mining camps. Very soon thereafter, the mill was remodeled in a long series of updates for capacity and efficiency. Wait built a large home near the mill. The town by the mill was called Delta until 1868, when by popular vote the post office was renamed Waitsburg, in honor of Wait. In 1870, the population was 109 people with 33 families. Mr. Bruce sold the property lots to many of the families on which to build homes and businesses. By then, it was known as "The Burg." Most early families supported themselves by farming, and soon trades such as blacksmithing began and businesses were established such as the brick factory, in addition to the flour mill. Several general and specialty trade stores were opened downtown. Mothers raised children, tended their homes, cared for vegetable gardens, cows, and chickens, made family clothes, and many other chores. Surplus products produced by the family were traded for items they could not make themselves. Children helped with chores around the home and farm and attended school, if they were lucky. The first school had 24 students. In 1880, the population had more than doubled in size to 248 people. Mr. Bruce was quite involved with the expansion of the OWRNC (Oregon Washington Railroad and Navigation Company) which began in Portland, Oregon, making it possible to travel by rail from other cities to Prescott, Waitsburg, and Dayton. The local newspaper, The Waitsburg Times, began publishing papers in 1878 and excerpts from the early days currently published as Pioneer Portraits are still entertaining the people of Waitsburg today. Saturday was the "Great Shopping Day" when the farmer and his entire family including grandparents would travel to town by buckboard and trade eggs or butter or whatever they had. The eggs were carried in a dishpan of grain so they would not break. The butter was covered with green leaves and a wet cloth. The streets were deep with dust or mud. "People were kindly, honest, and hospitable to a fault. They were generous beyond necessity." In the mid 1890's, a national economic panic (downturn) occurred. The summer was wet, the wheat died and many farmers in the area were financially ruined. They had huge loans, mortgages, and were deeply in debt. Many had to start over. 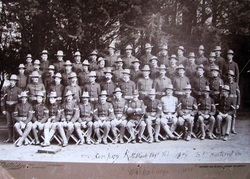 At the end of the 1890's, a group of young Waitsburg men volunteered to be U.S. soldiers in the Spanish-American war, which was fought to free Cuba from the control of Spain. They were sent to the Philippines for about 3 months in 1898. All of "Company K" returned safely. By 1910, the population was 1800 - bigger than today! The bustling town boasted hotels, grocery stores, clothing stores, general merchandise stores, livery stables and blacksmith shops, saloons, churches, lodges, and schools. For centuries, the area that would become southeastern Washington State was solely inhabited by native Americans. There is no record of any visitors to the region until the late 1700's. It is not known how the natives were organized or divided, but by the time the area began to be settled in the mid 1800's, several tribes lived nearby. To the south were the Umatilla and Cayuse, while the Walla Walla tribe occupied the region between what is now Waitsburg and the Columbia River. To the north were the Palouse, and to the east were the Nez Perce. Fur traders were working in the northeast US in the 1500's, and they eventually made their way into the Great Lakes region. But we have no record of any exploration further west at that time. There were voyages to the west coast, but they did not come this far north. It was in the late 1700's that Russian, British, and American sailors began to explore the northwest. Captains Cook and Gray were among these. In 1792, it is known that George Vancouver journeyed about 100 miles up the Columbia, but there are no reliable accounts of visits to this part of what is now Washington State. In 1804, President Jefferson sent the Lewis and Clark expedition westward to explore and map the area between the midwest and the west coast. They left St. Louis and traveled to the Pacific Ocean, passing near our region on the way. On the return trip, thanks to a shortcut suggested by the Walla Walla tribe, they passed directly through what would eventually become Waitsburg and the Touchet River valley. As they traveled, they made careful notes of what they found along the way. This area is described in their journals as having abundant game and good water. As the area became better known, attracting more early settlers, hostilities broke out in many places between the natives and the newcomers. Army cavalry forts were established here and there to protect the settlers and America's investment in this new land. Old Fort Walla Walla was established near the Columbia River in 1818, was rebuilt in 1841 following a fire, and was in use until 1856, when a new fort was built at the location of present day Walla Walla. The first two forts were forts in name only, however, and were actually trading posts. For this reason, the fort did not protect Marcus and Narcissa Whitman from the massacre of 1847. 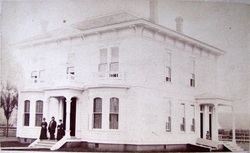 Shortly after establishing the military fort at the location of present day downtowon Walla Walla, it was moved to the present location of the Veterans Affairs facilities. The fort played a role as hostilities continued until the settlers overwhelmed the region, in large part due to the Homestead act of 1862. With the help of the forts and increasing numbers, more and more homesteading claims were made along the Touchet River, and the settlers began to grow wheat and other crops. Geologic history tells us that between 17 million and 11 million years ago and continuing until as recently as 6 million years ago there were several lava flows that deposited hundreds of feet of basalt near our region. The largest of these flows covered an area as big as a state. Some of them covered the area which is now Waitsburg and some of them missed us. These basalt flows came from fissures in the Earth’s crust, or vents rather than from volcanoes. The vents were generally in the vicinity of what is now the border between Washington, Oregon, and Idaho. Rain and wind began to erode the basalt and over millennia, creating loess, which is actually topsoil. The layer of loess was also hundreds of feet thick. Beginning at about 11 million years ago the continual movement of the plates in the earth’s crust created fault lines and eventually mountains were pushed up along with other features such as cliffs that would eventually define watercourses. While all of this was taking place plant and animal life were coming into existence. The first modern humans are thought to have arisen about 200,000 years ago. At about 125,000 years ago they had moved from Africa into the near East and Turkey and by 50,000 years ago they had populated southern Asia. The geologic record shows that there was an ice age at around 20,000 years ago and this may have been what facilitated the movement of humans into North America approximately 15,000 years ago. The earliest discovered fossil record of human habitation in the Northwest is approximately 13,000 years old. Beginning at approximately 17,000 years ago a series of events occurred which would have an enormous effect on the geology of the area. The river in Montana now known as Clark Fork was covered by an advancing tongue of ice, creating a dam about 2000 feet high which eventually impounded a lake of over 3000 square miles. When the water got near the top of the dam the ice melted releasing a wall of water between 300 and 1100 feet high depending on the location. The water raced across the land and found the Columbia River drainage where it continued to Wallula Gap. There is evidence that it pooled up there, forcing water up the tributaries to and possibly beyond present-day Waitsburg. Geologists believe that this is the largest flood that ever occurred on Earth. When the water slowed down at Wallula large quantities of silt and gravel were deposited near our region. According to the evidence the ice reformed and a new lake was impounded and released in a subsequent flood, and this may have happened many times over a period of several thousand years, possibly overlapping the beginning of human habitation. This scenario of repeated flooding leads to a butte and basin topography of which the Walla Walla basin is a recognizable part. Some researchers have suggested that floods occurred as close together as 50 or 70 years. One wonders how humans living in the area would have reacted. Given the nature and ferocity of the floods it is quite likely that if people were there, many were caught and died in the floodwaters. Those that escaped would have resettled on higher ground, perhaps quite close to what is now Waitsburg. Since the floodwaters apparently subsided within a couple of weeks, it is quite possible that the lure of living next to a major river might outweigh the eyewitness and legendary accounts of the flood. New settlements would move downslope closer to the river and into harm’s way. When the skull of Kennewick man was discovered in the Columbia River a few years ago it was determined to be some 9000 years old. So at least by this time people were living along the river. These people were hunters and gatherers. Large reptiles had died out on earth millions of years before and the mammals were the primary game along with the fish. One creature thought of as prehistoric is the Mammoth which may have overlapped human habitation by 1,000 years or so. Many native plants were cultivated and harvested. The people gradually formed into tribes, which existed for thousands of years and they still do.